Veterinary Integrative Center is a full service small animal hospital providing comprehensive medical, holistic, surgical and dental veterinary care to the city of Redlands and surrounding areas. We here at Veterinary Integrative Center understand that your pets are beloved members of the family, therefore the well being and health of your pet are our top priority. Our highly trained team is committed to providing the highest quality and compassionate care for the life of your pet through both traditional and complementary medicine. Complementary medicine encompasses health and wellness therapies such as acupuncture and herbal medicine, and is used alongside conventional medicine to provide the optimal care for your pet. Medicine is not an exact science. What works for one patient may not always work for another. By providing personalized care through both traditional and complementary medicine, this integrative approach increases the options for your pet, and improves the ability for us to address certain medical conditions that might not respond to a single treatment modality alone. Our hospital is equipped to handle cases ranging from wellness and preventative care, to daytime emergency care and surgeries. We offer a broad range of services individualized to your pet's health. A small but dedicated staff gives us the opportunity to get to know you and your pet on a personal level. You can always expect consistency with the care. Call us today to make an appointment , or stop by during our office hours to pay us a visit. We always accept new clients and patients and welcome the opportunity to be part of a team that helps your pet achieve the highest level of health and well being. ​We are excitited to announce that starting in February 2018, Dr. Marissa Palmer D.C. will be offering chiropractic services at our facility 1 -2 times a week. To schedule an appointment with her, she can be reached at 702-460-5704 or visit her website https:// socalanimalchiropractic.com. Dr. Han Huang (known to his clients as Dr. Han or just Han) grew up in the Los Angeles area. He acquired a love for the sciences and nature at a very early age, thus leading him to complete his undergraduate work at UC Berkeley with a degree in Integrative Biology. It was during his years at Berkeley volunteering at the Oakland Children's hospital, the Oakland zoo, and Berkeley's Lawrence Hall of Science when his interest in medicine and in working with animals developed. Upon graduation, he returned to Los Angeles, and spent time working at a small animal hospital, gaining valuable experience and insight that furthered his interest in a career in veterinary medicine. He obtained his doctorate in veterinary medicine from UC Davis in 2001, and returned to Southern California to practice. His initial employment brought him to the Inland Empire, where he has been practicing for the past 15 yrs. The experience and knowledge gained working at various hospitals eventually convinced him to become a practice owner, allowing him to incorporate his passion for medicine and for animal health and welfare and his practice philosophy into his vision of the ideal small animal hospital . In addition to his interest in all aspects of general medicine and surgery, Dr. Huang also has a strong interest in integrative medicine. He has recently completed his initial studies in Traditional Chinese veterinary herbal medicine, with plans to complete acupuncture training and certification in the near future as well. 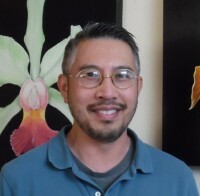 Outside of veterinary medicine, Dr. Huang is passionate about plants and spends most of his free time gardening and studying and exploring the California native flora. You will often find him at the Rancho Santa Ana Botanic Gardens for weekend morning walks. He also enjoys painting, running and spending quiet moments at home with his three cats Spaz, Ralphie, and Grummie. 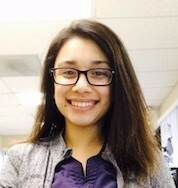 As a veterinary receptionist of 16 years, Georgiana is happy to be a part of Dr. Han's team. Her love of animals and her willingness to help people make this the perfect job for her. She knows how important your pet's health concerns are and is just a phone call away to assist you. Whatever your veterinary needs may be, she's here to help. When she isn't helping you with your pet, you'll find her heading off on a camping trip with her husband Jack and their dogs, or trekking off to a rock concert with her daughter. Her 4-legged family consists of a Golden Retriever, an Aussie and an orange Tabby. In addition, she also has a 3-legged cat "Skippy". Not a day goes by that they don't make her smile. Rebecca (Affectionately referred to as Becky) is our head technician. 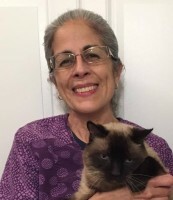 She joins out team with almost 40 years of of experience in the veterinary medical field. She earned her Associate's Degree in Animal Health Technology from Mt. San Antonio College in 1980, and received her certification as a registered veterinary technician shortly thereafter. Her interest in working with animals started at a very young age when she would accompany her father to the vet's office whenever one of the family pets needed medical care. She was intrigued by the duties of the technicians and the level of care they provided for the patients, and knew then that this is what she wanted to do. She feels very fotunate to have been able to continue to work in a field that has seen so many advances and continues to offer so many challenges and rewards. Outside of work, Becky enjoys seasonal arts and craft, crocheting, gardening and camping. She also enjoys time spent with her grandkids and her family that includes 7 cats, 3 dogs, 2 tortoises and a turtle. Maggie has been working in the veterinary medical field for the past six years. She started in the profession as a receptionist and over the years, has transitioned to becoming a technician. 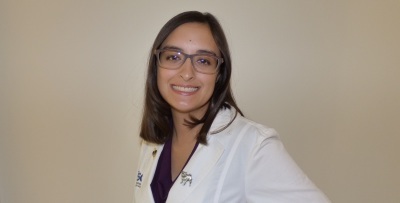 Her other employment at a specialty hospital has helped her gain valuable experience in emergency medicine and she hopes to continue to expand her knowledge in other areas of the field. She is working towards her bachelors degree in Microbiology. and has just recently passed her state and national boards to become a registered veterinary technician! Please help us to congratulate Maggie on a job well done. She currently shares her home with her boyfriend Gabe and their recently adopted kitten Benny. In her spare time she enjoys running and going to the beach.